I woke up the other morning to find snow on the ground, which quickly melted in places the sun could reach but remained in the shadows throughout the day. 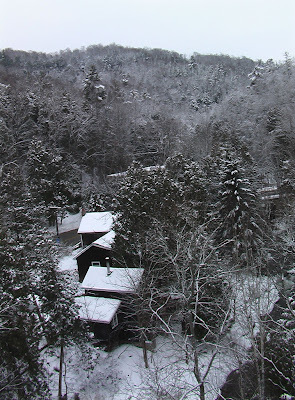 I grew up in Canada and have always enjoyed the distinct pleasures of each season. Fresh snow has a different effect on me than it does on most Dubliners, especially this year as my family and I did not make our annual pilgrimage to the rural winter wonderland that I grew up in (we are finally being realistic about our responsibilities for adverting the climate crisis). The “severe frost” that the Irish suffered through for a few days – down to a low of -3C – is almost laughable when compared to the -20C regularly experienced by my family near Toronto. Of course each society adapts to its own environment. For example, our house in Dublin was not designed to be comfortable during sub zero weather and would likely become uninhabitable if Ireland were to experience a lengthy Canadian hard freeze. Similarly, all of the vegetables that I am currently harvesting from my exposed allotment on the outskirts of Dublin can easily survive the recent snow and cold weather, but nothing would remain edible below -20C. Growers in Canada have adapted to these hard freeze conditions by pulling everything up in December and accepting that nothing will be harvested again from the garden until June unless significant winter gardening techniques are used (my favourite book on this topic is Four-Season Harvest by Eliot Coleman). This six month period was traditionally bridged by a substantial store of food in root cellars and preserves, but the hunger gap of spring left many of the early settlers to the region malnourished. Today, an endless stream of trucks from the warmer growing regions of California has effectively eliminated this recurring threat to the health of Canadians, even if it is causing considerable damage to the health of our planet. In Ireland we are increasingly relying on the steady stream of trucks from Spain and flights from Kenya and beyond even though we do not have comparably harsh conditions to deal with. Establishing year round local food systems in Toronto would be difficult, though possible, but in Dublin I have found it to be much easier. I am still amazed at the diversity of vegetables that I can harvest fresh from my allotment every month of the year. Of course parsnips are the king of winter vegetables, becoming sweeter after a few hard frosts, and providing the ground is not frozen or waterlogged, they are content to stay in the ground until needed. 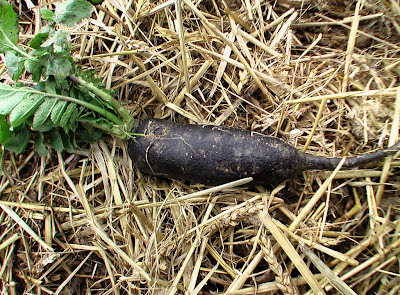 Celeriac, winter radish, scorzonera and salsify, though not traditionally part of the Irish diet, will easily wait out the Irish winter in the place where they grew. 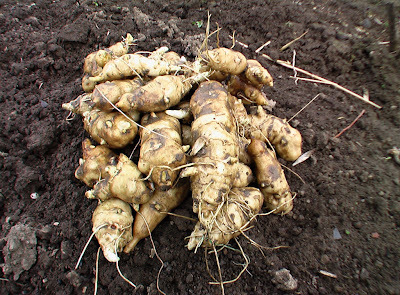 It is also best to leave Jerusalem artichoke, or more accurately the sunroot, buried until needed. Add the roots and tubers traditionally stored in the shed or cellar, including potatoes (the staple of the Irish diet), swedes (referred to as rutabaga in North America but which the Irish insist on calling turnips), beetroot (the most noble of all vegetables) and the humble soup carrots, and you have a feast readily available throughout the cold months and into the spring. Last year, as an experiment, I planted an early variety of carrot in August, covered the bed when the weather changed with a moveable cold frame (a box made from scrap wood covered by an old window), and continued to harvest the delicious tender carrots until they ran out a few weeks ago. Their growth slowed but they became sweeter and more crisp as winter arrived. My daughter and the neighbourhood kids gobbled them up so quickly I will need to plant many more of these delicate winter carrots next year. With all of these root vegetables, we are consuming the dormant store of energy and nutrients saved up by the biannual plants in order to produce abundant seed in the second year. When we eat the leafy winter brassicas, we are instead relying on the abundance of slow growing but hardy leaves that will collect the energy needed to produce buds and flowers once the warm weather arrives. There are many leafy brassicas that can be harvested fresh through the winter and early spring, but the hardiest of these is kale, which I have grown to love and has become a staple of our winter diet. 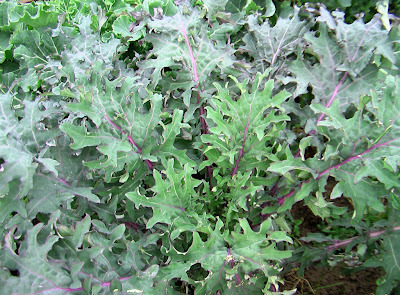 Some varieties of kale are hardy enough to survive a Canadian winter, if you were willing to dig them out of the snow. Brussels sprouts are another hardy seasonal treat, which would probably be liked by more people if not for the unfortunate habit of over-cooking them. Cabbages and cauliflower have been so extensively bred that varieties are available fresh throughout the year, but I am anxiously waiting for the short season of the purple sprouting broccoli to begin. I wish I had planted an early variety, as well as the heavier cropping late variety, which would have extended the season by almost a month and I would only have had to wait a few more weeks before they started to produce their beautifully flavoured spears. Chard is a hardy leafy version of the beetroot, which thrives in the cooler climate of Ireland, providing tender greens and crisp stalks throughout the year. But with a bit of protection from a mini-polytunnel, a cold frame, fleece or a cloche, there is an enormous diversity of tastes, colours and textures available from lettuces, spinach, endive, chicory, parsley and many more exotic salad plants. As with the delicate winter carrots, a bit of protection from the frost and wind can extend the season of many plants right through the Irish winter and into the hunger gap of the spring. This same protection also allows these same plants, and many others, to be started earlier. Another common winter vegetable is the mellow flavoured leek, which would be standing proud all winter had the local rabbits not feasted on them last summer. 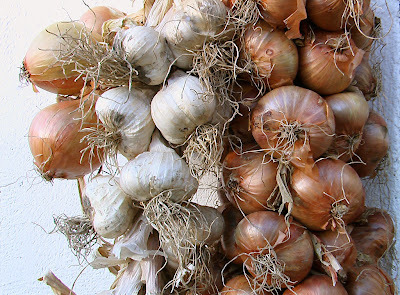 Luckily we have a store of onions, shallots and garlic, which seem perfectly content to hang around in our rather cold kitchen and will last at least until the spring onions become available. To finish this list I must mention squash and pumpkins, my favourite winter food. I realise that they are a bit out of place here as they not winter vegetables and will not tolerate frost. They require the warmth of the summer to grow, but they do provide an easily stored source of nutrients, colour and flavour that is very welcome at this time of year. Although the larger pumpkins might only keep for a few months, many types of squash, especially some of the Japanese varieties, will last through until late spring, providing you plant a variety that will mature properly in the cool autumns we normally experience and can find a storage place that is neither too cold nor too damp - in our house, the unheated but insulated attic has the best conditions but it unfortunately keeps these beautiful fruits out of sight. This diverse array of winter vegetables does not include anything that needs to be processed, frozen, packaged, trucked, shipped, airlifted or stored in a place more elaborate than a cool dark shed, a pantry or an attic. In fact many of them will keep better, and even become tastier, if they are allowed to remain in the ground where they grew. It is deeply satisfying to be able to go to the allotment or into the back garden and harvest the substantial part of an evening's meal, no matter what the season, and it is unfortunate that this experience has become so rare in Dublin. But, more importantly, it has become environmentally irresponsible to not take full advantage of the Dublin climate which allows us to harvest fresh food every month of the year. When I sort through seed catalogues and begin to plan for the coming growing season, I have to be mindful that there is so much still in the ground. It would be much easier to start from a freshly tilled allotment, a blank slate onto which I can arrange each crop. But with over-wintering vegetables to be harvested as late as May, and all of the new early spring crops to be planted in February, the overlapping seasons can be tricky to juggle. This extra effort of planning is, of course, well worth it with all of the fresh local food that we are still eating as we head in to a new growing season. This was the worst cob of fresh sweetcorn that I have ever tasted. But then again, I have been spoilt. Sweetcorn was one of the main food crops of the farms around where grew up and I have eaten a lot of wonderful fresh cobs in my life. During corn season, it was quite common to stop at one of the local farm-gate stands to pick up a dozen or two freshly picked ears. Anything else that we had for dinner that night was secondary to the main course of corn. The corn season lasted a few months and by the end of it we had had our fill and were content to wait until the next season. One of the big events of every year was our family reunion, which was simply known as "The Corn Roast" - a more accurate name, though less poetic, would have been "The Corn Boil". The event took place at my great uncle's farm in the fertile farming region of South-Western Ontario. Every year a bunch of us would head into one of the local fields, pick a lot of corn, then race back to the party, husk it, cook it then eat it quickly. We stuck to the idea that when you want to eat fresh sweetcorn, first you put the pot of water on to boil, then you walk out to pick the cobs and run back. Like many of the best summer vegetables the sugars in sweetcorn begin to change to starch as soon as they are picked. Breeders over the years have produced hybrid and super-sweet varieties, that last a lot longer, but nothing compares to the quality and taste of fresh picked sweetcorn. Sure, we had a lot of frozen and canned kernels of sweetcorn in between, but when I first moved to Ireland, I was slightly shocked when served frozen sweetcorn still on the cob. Ireland is not a big sweetcorn growing country and this was apparently considered the best option. It was disgusting stuff, chewy and tough with none of the pleasure of fresh sweetcorn, and even worse than canned corn. I have eaten more of it since, but have never warmed to the experience, preferring to wait until our trips to Canada coincided with sweetcorn season. Until recently, I had never eaten a fresh cob of sweetcorn that was not local and in season. 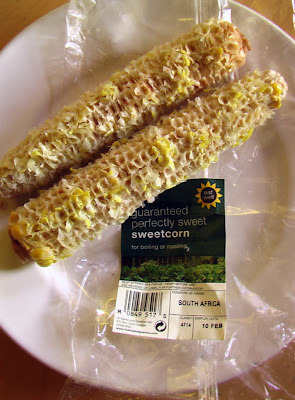 A few weeks ago I went out and bought a package of two "fresh" cobs of sweetcorn, flown in from South Africa! Trust me, I had a good reason. I was due to start teaching an extra-curricular gardening class to some of the kids at my daughter's school and I was preparing an exercise that involved a wide variety of different seeds and a correspondingly wide variety of different vegetables. The object of the day was to have them work out which seeds became which foods - relatively easy with sweetcorn, but a difficult task with cabbages and other brassicas. The kids would also be able to see that certain foods can be grouped together if their seeds were similar. A lot of the effect of this lesson would have been lost if I had used photos of the vegetables, and I wanted to make this a hands on experience, with hopefully a bit of tasting, as these were the foods that they would be growing. So, I went on a shopping spree to buy all sorts of fresh vegetables that were not in season, including the cobs of corn mentioned above, to add to the vegetables from my own allotment. I even picked up some fresh peas in the pod, French beans and runner beans which I have not bought in years because I find them so much better tasting fresh from my allotment that I have stopped buying them, even when they are in season locally. When I got home with my food-mile heavy purchases, I found out that the class had been postponed for at least a week! There were a few bureaucratic issues that needed to be cleared up and some health and safety concerns, which was fair enough given that the classes were to be held in a disused garden, part of which had become heavily overgrown. Well, one week quickly turned into a postponement of at least a month, until the entire site was completely cleared and planted. I was left with a lot of food that I otherwise would not have purchased, which would not last, and instead of letting it all go to waste, we ate it, of course. The peas were actually not too bad considering their age, most of the rest was mediocre, but the cobs of corn were horrible. I do not know how long ago the corn was picked, but perhaps the experience of buying them for an unfulfilled cause added a bit of bitterness to their taste. 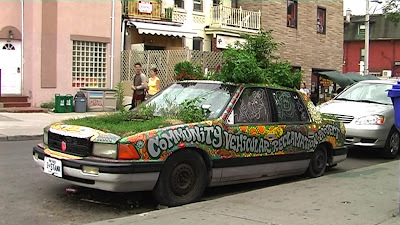 I stumbled across this great Community Vehicular Reclamation Project last summer in the Kensington Market area of Toronto. 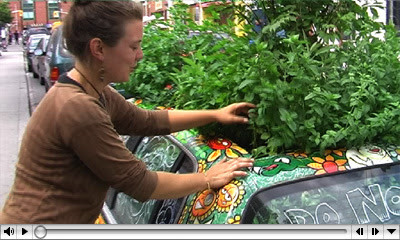 A group of people towed in a car from the junkyard, filled it with soil, painted it up, planted it with herbs, flowers and a few vegetables, and parked it on the street. 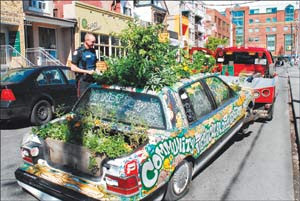 This is one of many anti-car events and actions in Toronto involving a group called Streets Are For People, which usually focus on reclaiming car dominated spaces for more enjoyable, creative and productive uses. Kelsey Carriere is one of the founders of Streets Are For People and has been involved in creating and maintaining this garden, and she agreed to talk about the project on camera. I love when food production is used as a form of protest! This is a project that was able to create and maintain a small community garden in an intensely urban place - which can be a difficult task. An interesting aspect of this garden is that it is located just up the street from an incredibly multi-ethnic range of shops selling fruit, vegetable, dry goods, fish, cheese and meat. 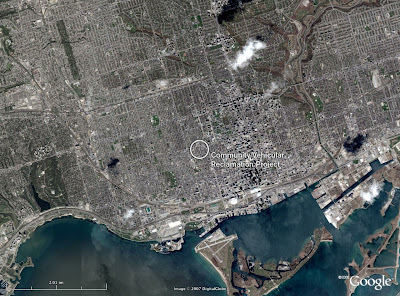 It is one of the best places in Toronto to buy food from around the world, but a fair amount of the food is produced in the Toronto region. It is quite common to see small scale personal food growing in the back and front gardens of the houses in this diverse neighbourhood, and I think that this area would be a great place for intensive urban market gardening to become established. It is a very mixed-use neighbourhood with a variety of industrial and commercial roof spaces, there is a lot of retail capacity and many local restaurants, there is a need for socially inclusive local employment, there is a huge amount of fertility available in the form of wasted fruit and vegetables, and most importantly it has a history of being unconventional and independent. Perhaps this project has too much of an anti-car focus for people to really see the possibilities and benefits of the food production aspect. In early September, the car was towed away but luckily it was intercepted half way to the impound lot and returned home. 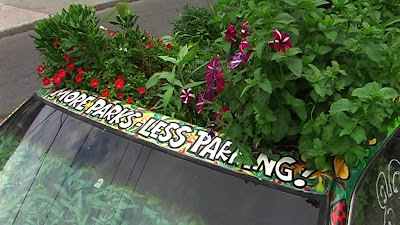 I hope it is still there and that many more of these AutoGardens start to appear. "The revolution will not be motorized"
In a previous post, I posed the question: Is there such a thing as urban food and rural food, or even suburban food? The distinction between the three major types of built environment are not normally applied to food, but I consider this an interesting question and an important distinction to make. Before I go any further, I should admit my bias against most things suburban. The suburbs were conceived as a hybrid form with "the best of city life combined with the ease of rural living" which has mutated into a form of human settlement than contains few of the good qualities of the urban or the rural. It has evolved a distinct personality, culture and economy, which has infected both the urban and the rural, damaging many of the positive qualities of both. 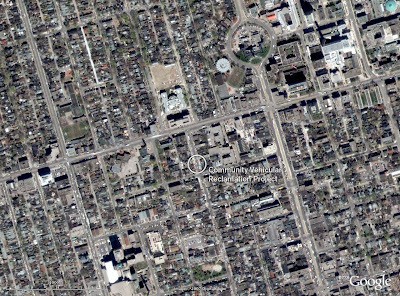 Many of us live a suburban lifestyle, regardless of the nature of the built environment that surrounds us. I could go on and on about this, but it is probably more useful to shift my focus to food. In trying to define the difference between urban, suburban and rural food, I think that it is easiest to start with suburban food because it forms the dominant food system of the world today. Most of what we, in the wealthy regions of the world, eat is suburban food, and much of the rest of the world depends heavily on suburban food systems to provide their basic diet. If a multi-national corporation or large company was involved in growing, processing or selling the food, if it has a brand, or if it has been advertised on TV, then it is probably suburban food. Only a small portion of the money spent on suburban food goes to the people who produced, harvested and processed it. Suburban food relies on huge amounts of fossil fuels and the flow of nutrients, resources, wealth and responsibility is almost always linear. It benefits from global distribution networks, existing 'free trade' rules, uniformity, commodities and an unaware consumer. The global economy depends on the dominance of suburban food, but the local economy is usually degraded by suburban food systems. Rural food is radically different as it is much more about homesteading and self-sufficiency. John Seymour was heavily involved in promoting rural food systems, as were Helen and Scott Nearing, and all who have followed their examples by 'going back to the land' have tried to immerse themselves in rural food. Millions of subsistence farmers throughout the world exist almost entirely within a rural food system, being largely self-reliant but perhaps selling surplus food or cash crops in exchange for things they cannot produce. Rural food has existed for thousands of years and functions for the most part outside of a money economy. Some of the surplus rural food may find its way into the suburban food system, but if the farmer produces mostly cash crops and purchases most of what they need, then they are no longer within the rural food system. Rural food systems keep the countryside populated, supply bulk goods and energy, are highly efficient at recycling nutrients and resources, and they provide people with an independence and security that they will not find in a suburban food system. When rural food systems fail, people tend to migrate to the cities, often becoming the urban poor requiring support or aid. So, what is urban food? If you remove suburban and rural food, what is left? While suburban food is based on linear systems dominated by corporate interests, and rural food is based on self-sufficiency gained through working within natural systems, I believe that urban food is based on complex cyclical systems and on societal interconnectivity. As towns and cities formed throughout history, complex networks of personal interrelationships and specialization were established to supply staple foods as well as speciality and processed foods. Urban food systems are usually the primary driving force behind the local economy, cycling wealth, creating a diversity of livelihoods and employment and maintaining the economic viability of the city and surrounding region. Independent urban regions (either smaller towns or larger cities) require urban food systems that recycle nutrients and energy in a sustainable way if they are to thrive over an extended period of time. Contemporary examples of urban food systems would include farmers' markets, community supported agriculture projects, independent restaurants, local grocery stores, bakeries and other local food processors. But it is urban agriculture systems, including small scale self-production, that have the most prominent role in establishing and maintaining urban food systems. Growing food within the urban area provides the most effective basis for nutrient cycling, for increasing local economic benefit and for the use of otherwise wasted resources. Urban food systems can be found anywhere from small hinterland towns to dense urban neighbourhoods, and provide for greater food security and develop a community resilience that would otherwise be unattainable. There are of course a lot of overlaps and grey areas in this tripartite division of our food systems. For example, it is common for surplus food from a subsistence farmer in Central America, to end up as a commodity in the suburban food supply chains, and to then be purchased as a basic ingredient by a local bakery in Dublin. Applying an accurate label to any given food product or system is not so important. But it is important to recognise the difference and to work to reduce the amount of suburban food that we eat and to strengthen both the urban and the rural food systems.